The Global Water Surface Temperature Sensors are high quality, rugged instruments with a precision RTD calibrated to US National Standards. The surface temperature sensor's output is 4-20 mA with a two wire configuration. Each of the surface temperature sensors is mounted on 25’ of marine grade cable, with lengths up to 500’ available upon request. 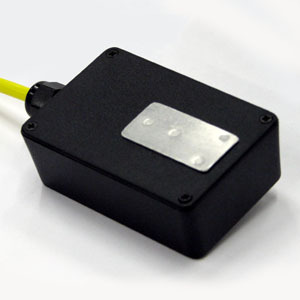 The surface temperature sensor's electronics are completely encapsulated in marine grade epoxy within an ABS plastic housing. The surface temperature sensors are well suited for many applications including, pipe temperature monitoring, solar panel temperature, water tanks, control panels, battery monitoring, and many others. What is Temperature and How is it Affected? Temperature is typically measured in degrees Celsius or Fahrenheit. To accurately measure temperature the surface temperature sensor should be mounted in direct contact with the surface to be measured. Using the surface temperature sensor's included silicone heat transfer compound will ensure that temperature transfer from the monitored surface to the sensor's heatsink will be efficient, minimizing the impact of ambient temperature on the measurement. Dirt or other insulators, like paper labels, can cause errors in the surface temperature sensor's reading or cause slower response times.